There are several species of Bearded Dragons in Australia. Those from the eastern states tend to be larger than those from the western limit of their range (in the state of South Australia). This species may remain still when approached or it may make a run for it and hide. 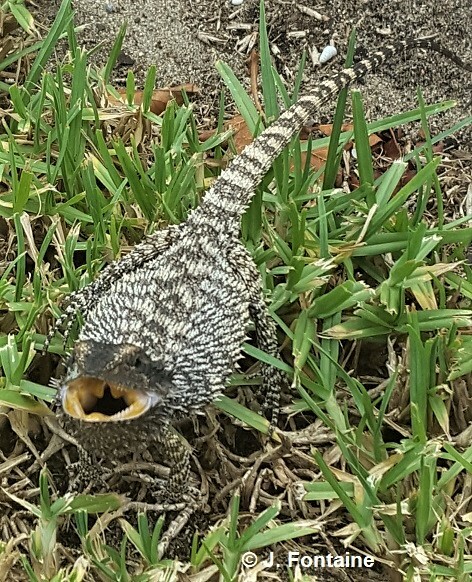 Sometimes when really upset they will extend their large beard, changing their appearance drastically and in many areas locals call them Frill-necks or some similar name, confusing them with the Frilled Lizard, which is not a type of bearded dragon. 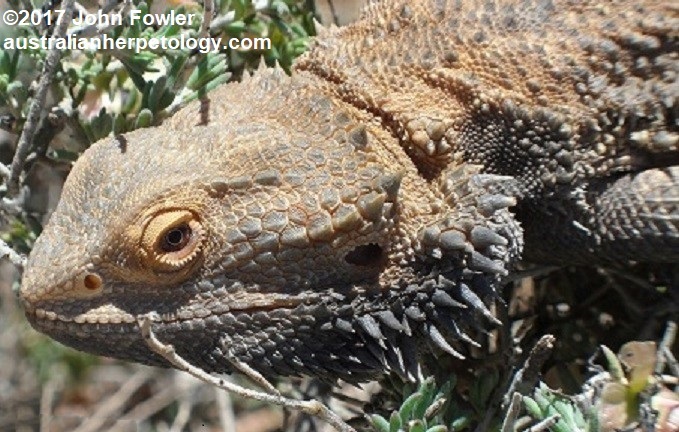 The Common Bearded Dragon is more highly strung than Inland Bearded Dragons, and although captive bred animals seem to adapt well to captivity if kept properly, older wild caught animals may be problematic. 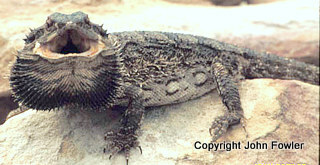 This species is one of the larger species of bearded dragons. other common names are the Rankin's Bearded Dragon, Lawson's Dragon and Prairie Dragon. 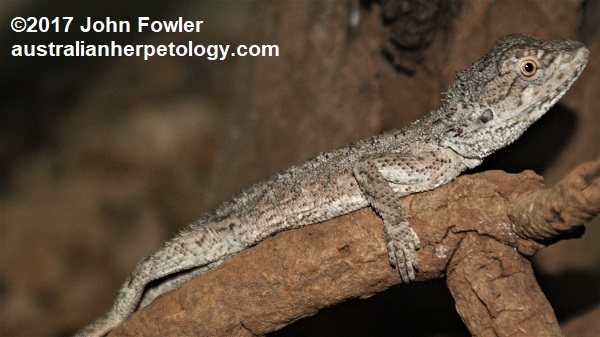 The poorly known Kimberly Bearded Dragon Pogona microlepidota appears to have the smallest known distribution of any of the bearded dragon species and is found in the Kimberley's in the remote North- West of Australia. I haven't heard of this species being kept in captivity yet. Almost all photos of this species are incorrectly labelled, and most distribution maps are incorrect. 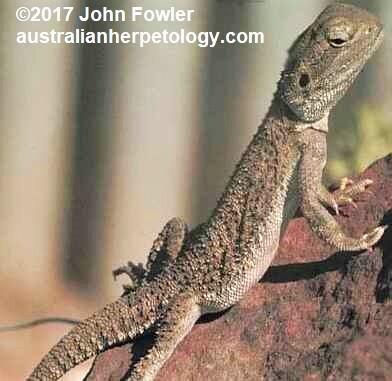 Another dwarf species (which is not available in the pet trade at the time of writing) is the Nullarbor Bearded Dragon - Pogona nullarbor This species apparently always has a banded tail. Not available in the pet trade. It resembles a sub adult Inland Bearded Dragon. In many inland areas, the Inland Bearded Dragon takes over where the range of the Common Bearded Dragon ends. 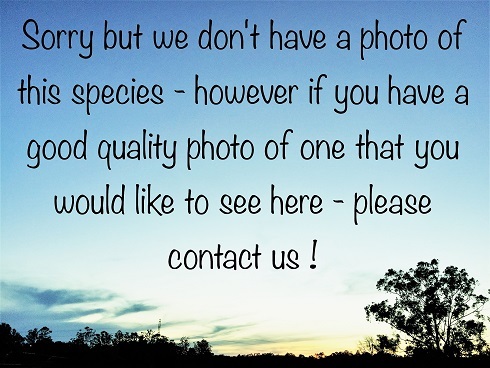 This is the species that is most commonly seen in the pet trade in Australia and overseas. It will readily hybridise with the Common Bearded Dragon in captivity (and apparently also in the wild in some regions) and does occur coastally in parts of its range in South Australia. Through parts of their massive range their colour sometimes varies from area to area, occasionally depending on the colour of the sand in that area. Orange, yellow, red, pale grey, and red headed forms are some forms I have seen in my state of South Australia. The colour of bearded dragons however often is dependant on the temperature or emotional state of the lizard in question. I remember finding one lizard on Eyre Peninsular that had dug a shallow burrow and filled it in behind him. When I dug him up he was an ordinary grey looking animal but a few minutes later when I showed him to someone else he had turned very orange. 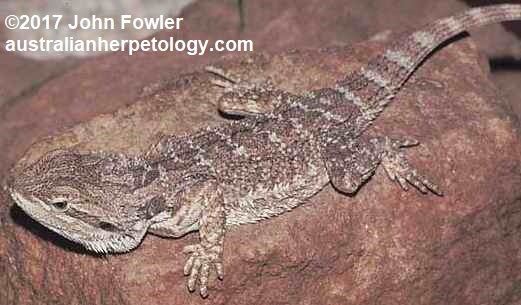 This species is one of the larger species of bearded dragons. The "German Giant" has been selectively bred in captivity and larger than wild caught Pogona vitticeps. The "leatherback" is also a captive produced morph with a genetic anomaly that causes it to have a smooth back with no spines, they have been produced in Italy and in The US. The "Silky" morph has been bred from "Leatherbacks" and has even less spines, and more smooth skin however these are apparently prone to health problems, possibly due to too much inbreeding. Another yet to be described bearded dragon is said to be similar to the Black-Soil Bearded Dragon but brick red with a white belly.